Have the changes in the powers and influence of the European Parliament over the last ten years exacerbated or rectified the 'democratic deficit' within the EC Legislative System? Have the changes in the powers and influence of the European Parliament over the last ten years exacerbated or rectified the 'democratic deficit' within the EC Legislative System? The three significant legislative institutions of the European Community can be cited as the Council, Commission and European Parliament. Legislative passage can be achieved by using a variety of procedures. Each of these procedures affords a differing role to the European Parliament and therefore the balance of EP power is never static. Although traditionally, the Parliament had a nominal role in the legislative system, by way of the Consultation procedure, over the last ten years treaties have extended the role of the European Parliament, by the introduction and amending of the Co-decision procedure. Changes over the last ten years now mean the most important legislation is now largely passed via the latter procedure, which has considerable consequences for democracy within the EC legislative system. 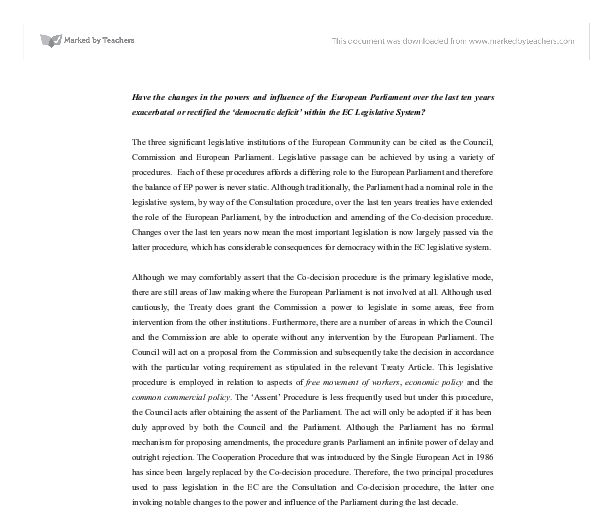 Although we may comfortably assert that the Co-decision procedure is the primary legislative mode, there are still areas of law making where the European Parliament is not involved at all. Although used cautiously, the Treaty does grant the Commission a power to legislate in some areas, free from intervention from the other institutions. Furthermore, there are a number of areas in which the Council and the Commission are able to operate without any intervention by the European Parliament. The Council will act on a proposal from the Commission and subsequently take the decision in accordance with the particular voting requirement as stipulated in the relevant Treaty Article. ...read more. Ultimately however, the power and influence of the European Parliament have been increased in the legislative system and this has inevitably led to observations as to the effect these changes have made to the so-called 'democratic deficit'. The 'democratic deficit' was a popular academic theme during the 1990s, expounded particularly by Joseph Weiler in his article "European Democracy and its Critique3". Essentially, Weiler identifies seven elements of the legislative and institutional structure, which evince anti-democratic criteria. However, one could say that the democratic deficit in the system arising from the position and powers of the European Parliament cannot be easily defined, for the interrelations of the various EU bodies creates shifting balances of power which preclude simplistic and generalist assertions about the strength of European democracy. However, the arguments suggesting a deficit will be described but with close regard to the European Parliament. The 'democratic deficit' can be highlighted, one could say in terms of the executive dominance of the EC legislative process. The transfer of competences from member states to the Council and Commission had over time enhanced the executive power of national governments at the expense of their own national parliaments, who no longer had the same level of scrutiny over laws being made. However, more importantly, whilst these EU bodies had their legal powers augmented, neither were directly accountable via suffrage of EU citizens- only the European Parliament can make this claim of legitimate direct mandate. For many years, the legislative system marginalized the European Parliament by way of legislative means such as the 'Consultation' procedure. ...read more. 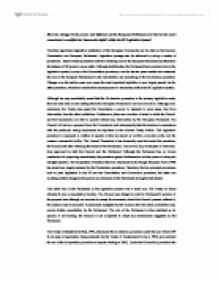 If we continue to use 'a very specific normative yardstick with which to measure the democratic quality of European policy-making processes'11 then, due to the unique structure of the European Union and therefore its legislative procedure, we are unlikely to ever see the 'democratic deficit' completely rectified or exacerbated. If we adopt Weiler's philosophy we are able to see the democracy deficit of the European Union considerably rectified: the changes in the power and influence of the Parliament have placed the intergovernmental and supranational institutions of the Community on an equal footing that arguably brings into being 'the twofold legitimacy on which the Community is founded, its State and its peoples'12. In this respect the equal position now afforded to the Parliament has bought this twofold legitimacy to the legislative system, and has arguably bought greater democracy to the unique community that is the European Union. 1 EP 'Activity Report for 5th Parliamentary Term' PE 287.644 2 A. Kreppel, 'Moving beyond procedure - An Empirical Analysis of European Parliament Legislative Influence' in Comparative Political Studies Vol. 35 No 7, Sept. 2002 at 786 3 Weiler, Haltern and Mayer from J.Hayward The Crisis of Representation in Europe 4 M.Westlake, A Modern Guide to the European Parliament (Pinter, 1994), 28. 5 Michael Shackleton and Tapio Raunio, 'Codecision since Amsterdam: a laboratory for institutional innovation and change' 6 ibid 7 Michael Shackleton and Tapio Raunio, 'Codecision since Amsterdam: a laboratory for institutional innovation and change' 8 Mancini, 'Europe: The Case for Statehood' 9 Craig & DeBurca EU Law text, cases and materials p.171 10 C&D p.172 11 Adrienne Heritier, 'Elements of democratic ligitimation in Europe: an alternative perspective' 12 C&D p.172 ...read more. and the Council of Ministers. The different institutions must work together in order to make policy, meaning an emphasis on making bargains Bargains occur between the member states in the EU Council and European Council, inside each EU institution and between the EU institutions. Broadly speaking, MEPs will vote along the European Party line, although in some cases they will place national party preference over EU party preference. For example the EPP-ED voted in favour of the new constitution, apart from the Conservative contingent of it, who voted against the new Constitution (in line with national policy). If the euro is a stable currency it will almost certainly be more widely used than the combined 11 currencies of the EMU countries. In other words, the euro is expected to be a more widely used currency than the sum of its constituent parts. This attitude as well as the worsening agricultural conditions influenced the terms of the New Law particularly the abolition of outdoor relief for the able- bodied poor. Undoubtedly the Whig government was a major influence on the terms of the new Poor Law. to the Union the functional political boundaries of the polity have been effectively re-drawn." (Weiler, 1995, 232) This situation has several implications for democracy, namely that the citizenry has been distanced from the democratic government, a situation labeled by Weiler as "inverted regionalism." The council of ministers is a step down the chain, problems unresolved here are untangled by the council. It exercises day to day executive control of the EU. It enacts regulations, directions, decisions and recommendations or opinions. It co-ordinates the general economic policies of members states and concludes international agreements.